Protesters marched through the Public Garden in Boston on Sunday during a march to promote vegan lifestyles. About 100 red-shirted animal rights activists marched from Boston Common to the door of a Kenmore Square McDonald’s Sunday afternoon, passing sausage stands in the park and diners on the sunny patios of Boylston Street. 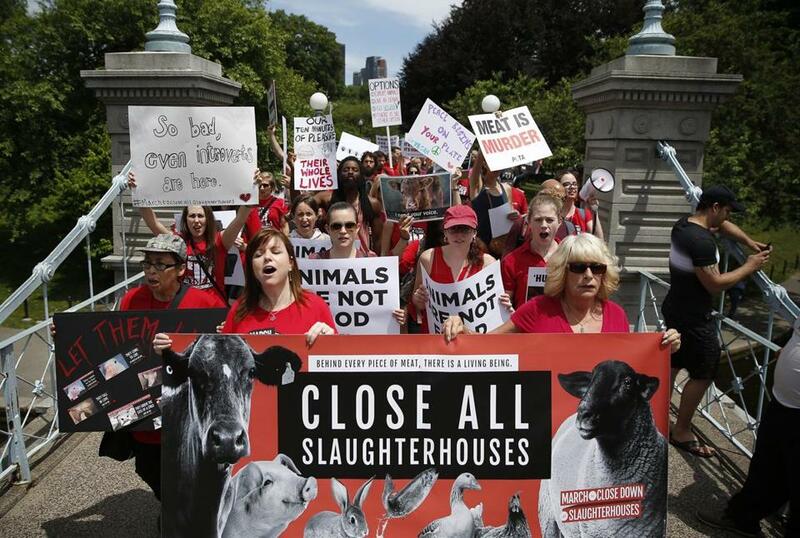 The Boston branch of the international “March to Close Down All Slaughterhouses” took to the streets Sunday to decry animal cruelty and promote veganism, according to Laura Ray, an animal rights activist from Boston who organized the event. “If you did to dogs and cats what is done to animals in the food industry, you’d be arrested,” said Ray, 59, in an interview before the march. As the group marched through Boston Public Garden, Shlomy Goldman, 35, said he believes everyone shares a natural compassion toward animals. “I don’t think that in my heart I’m morally superior to anyone who is not vegan,” said Goldman, a Messianic Jew who carried a homemade sign with quotes from the Bible on one side and from Russian author Leo Tolstoy on the other. “You don’t have to teach the public to be compassionate; you just have to teach them what they’re doing when they eat meat,” said Goldman, a Montessori teacher who lives in Brighton. The roughly two-hour march ended with a “die-in” at McDonald’s, accompanied by what organizers said were recordings of animals being slaughtered. On the way there, the protesters chanted their way past patrons in outdoor cafes, many of them enjoying meat dishes. One 45-year-old father, standing in the doorway of a Copley Square restaurant, defended his young daughter and her mostly eaten hamburger. Libby Frattaroli, 67, said she was around the same age, growing up in an Italian family in East Boston in the 1950s, when she first became concerned about where the meat she ate came from. She said she heard chickens “cry as their throat was cut” at a butcher shop in Maverick Square and told her mother she would never eat chicken again. “She started yelling at me in Italian,” Frattaroli remembered, laughing. “I still think about that today,” she said. Frattaroli carried a sign depicting cruelty to chickens in the march, holding it up for restaurant patrons to read. Did she ruin someone’s lunch on Sunday?